Today is my last day of shooting Life After Top Chef for Bravo. I've been following chef Richard Blais around Atlanta for the past two months and the entire experience has been incredibly fun. He has taught me the importance of making simple, delicious food, which seems to always come back to proper seasoning. Salt, pepper, acidity... So in honor of our last day on set, I decided to post about a company who knows all about good seasoning, Bourbon Barrell Foods of Louisville, Kentucky. 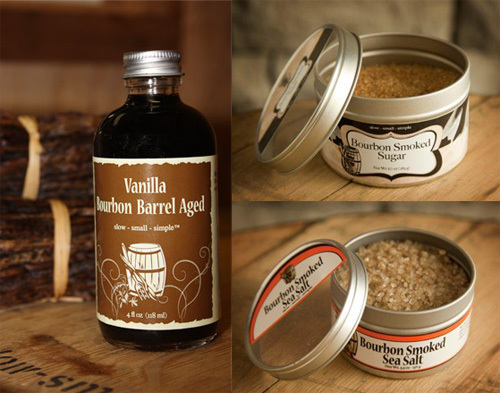 The creators of Bourbon Barrell Foods follow one mantra when making their high quality products; slow, small and simple. All of their products utilize ingredients sourced locally from Kentucky farmers as well as their infamous spirit- bourbon... straight from Bourbon County. Their sauces and marinades would make a great addition to your Memorial Day festivities. These include worcestershire sauce, which uses sorghum for sweetness; Kentuckyaki, which is their Kentucky style teriyaki made with bourbon, sorghum, ginger and garlic; And their popular Bluegrass Soy Sauce that is microbrewed in small batches. As stated on their site, "it's smoky and brothy with hints of oak and a mild sweetnesss reminiscent of fine Kentucky bourbon."